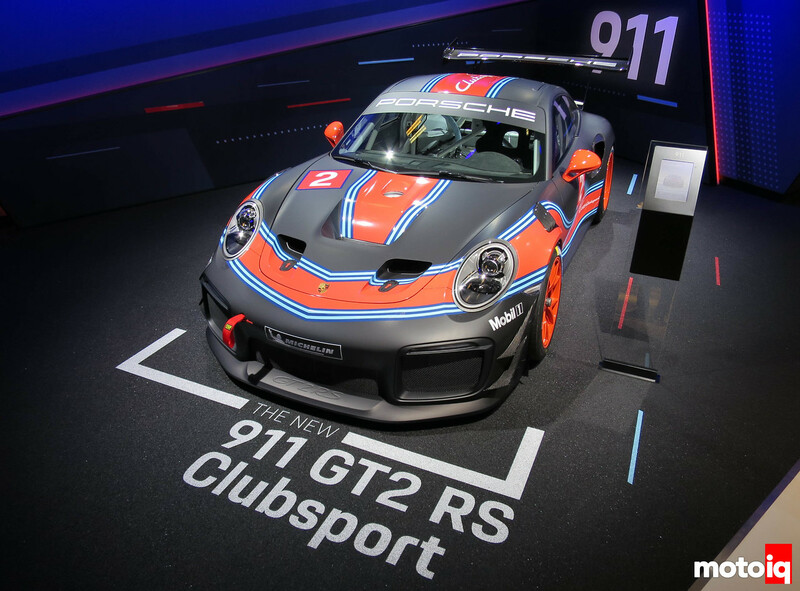 The eye-candy this year was the 911 GT2 RS Clubsport which is the track version of the GT2 RS Porsche brought last year. 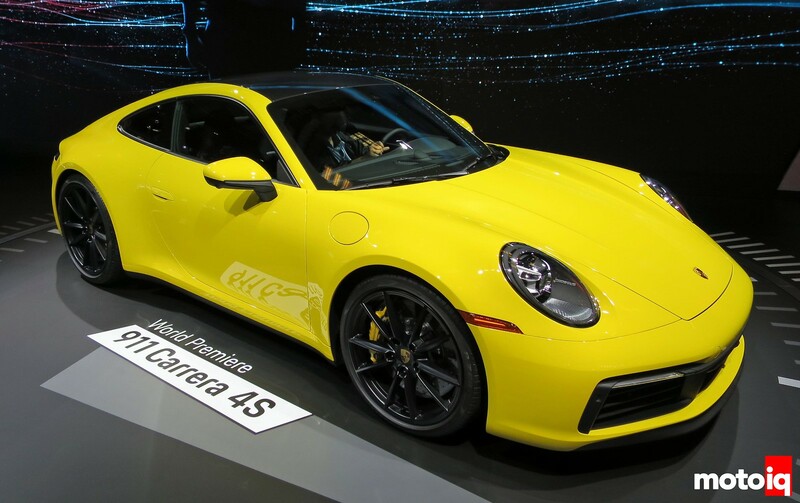 The huge reveal for Porsche this year was the 992 generation Porsche 911. The 991.2 generation was a bit of a hack job on the powertrain side as I’m sure the engineers were told to stuff the new 3.0L twin-turbo engine into the existing packaging with minimal changes. So, what did that mean? The engineers used a similar layout for the turbos, air filters, intercooler placement, and ducting as the existing Turbo models. However, the main difference was the Carrera didn’t have the nice rear fender air scoops as the Turbo models to ram air to the intercoolers. Hence, the Carrera had to get creative with ducting getting the intercooler air from the same area as air filters, i.e non-optimal. The 992 addresses those issues with a completely new intercooler setup along with improvements to the turbo setup. Not a lot of cars can pull off yellow well, but I think the 992 does a good job. Notice the new flush door handle design for reduced aero drag. Pulling the release lever for the rear cover gets you this much access. So, all you can do is top off some fluids and you can see the two little fans for pulling heat out of the engine bay. With the deck cover up, you can see the airflow path to the new intercooler too which shaves off a couple feet of narrow ducting compared to the 991.2 which should improve performance. This is one-half of the new intercooler which sits where the air filters are located on the 991.2. On the 991.2, this is also the location of the air ducts which feed air to the intercoolers mounted in the rear fenders. Hmm…. It may be prudent to check this area for leaves and other debris once in a while and vacuum it out. The intercooler air still dumps out behind the rear tires. This is the new turbo and header setup. The new manifold is basically a log manifold which has flow from all three ports going in the same direction to the turbine inlet of the turbo. 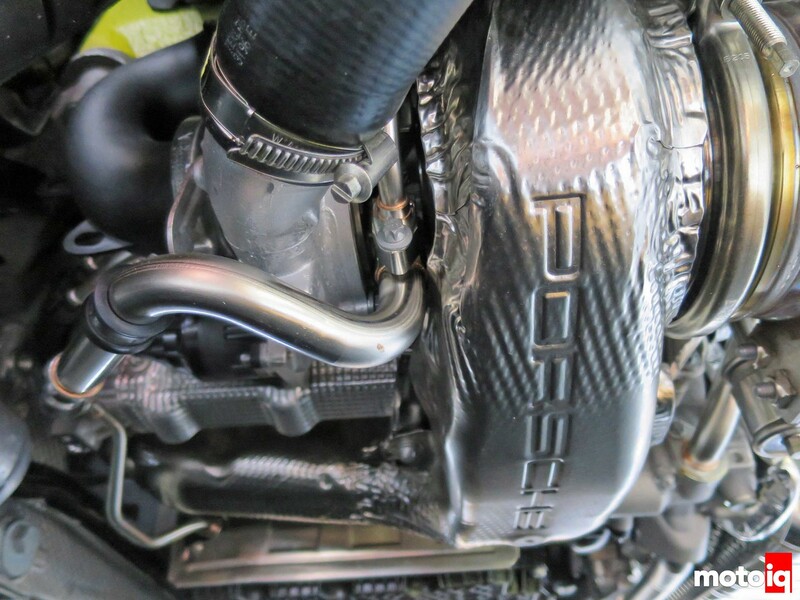 Porsche has included extensive heat shielding now over the manifold and turbine housing which was not part of the 991.2 package. Another interesting bit is the turbo oil drain sump has been eliminated. So maybe the turbos have been moved up a little bit and/or the large diameter drain tube has sufficient volume to act as the sump. Save 42 Pounds off of your car with Lite Blox Batteries! Mike Kojima in Masters of Motors SEMA Video! Always thoroughly enjoy a look at these new performance cars through your eyes Khiem. Keep them coming! Thanks Blake, much appreciated! For us guys who like to modify our cars in our garages, lots of lessons to be learned from the OEMs. And now with Porsche being almost all turbo, lots of lessons for those slapping turbos on there rides. Lots of aero tricks too for the track and time attack crowd. 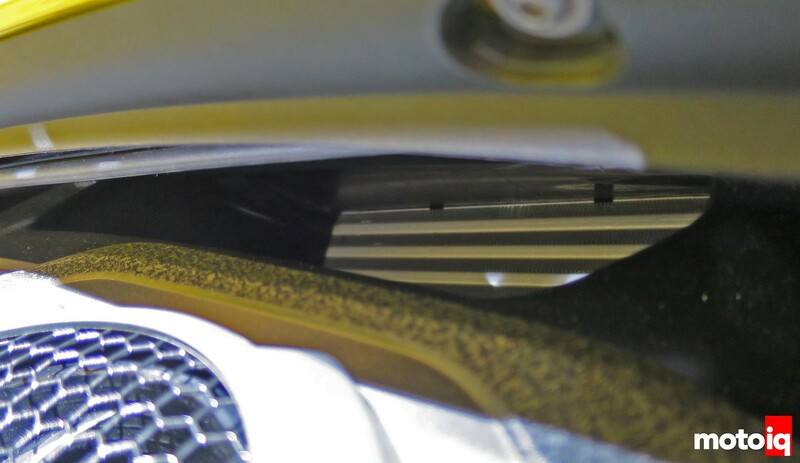 Indeed, currently planning some underbody aero for my project and thinking to replicate the turning vanes as seen on the McLaren and GT2 here. Exactly Khiem, I always follow the OEMs, especially when they track their cars. They spend millions and we get to reap the rewards. A patient engineer is a good engineer. Why do the heavy lifting, if you don’t have to? BTW, there’s a reason the mechanics in F1 religiously guard their cards. As soon as an engineer sees the goods, it’s practically over. Reverse engineering isn’t as hard as it looks. Surprised to not seeing the adoption of electronic wastegates in the aftermarket community (having so many people so obsessed with turbos and all)… No real advantage or is really cost the factor? Well, I think becauseof two main issues: how to control and also many people go with external wastegates.